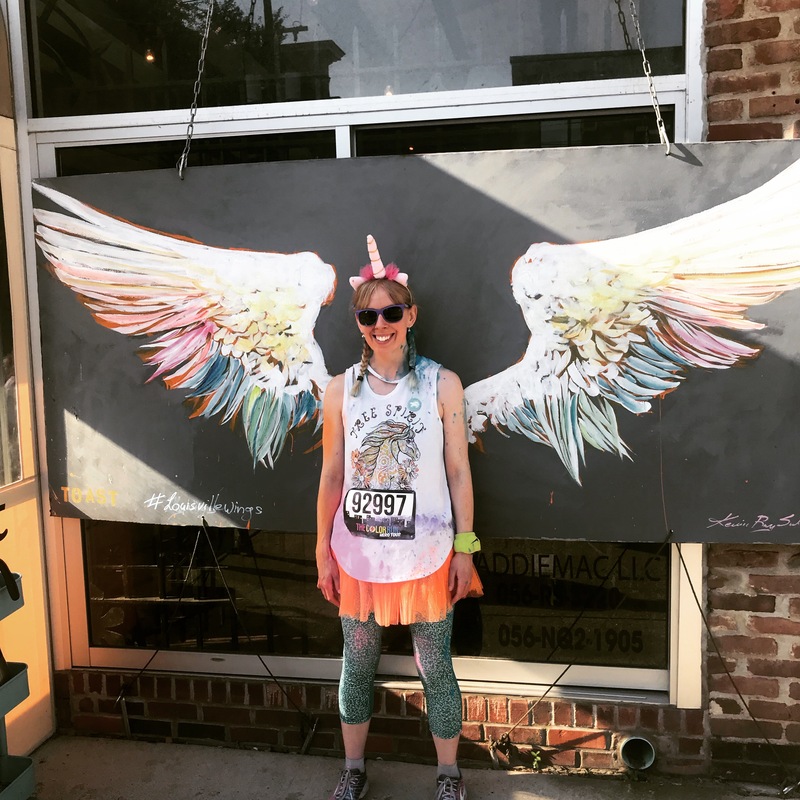 The running community has given me a lot over the years. Honestly. Locally and nationally. I’ve met some amazing people through races and events and I’m forever grateful for the support. 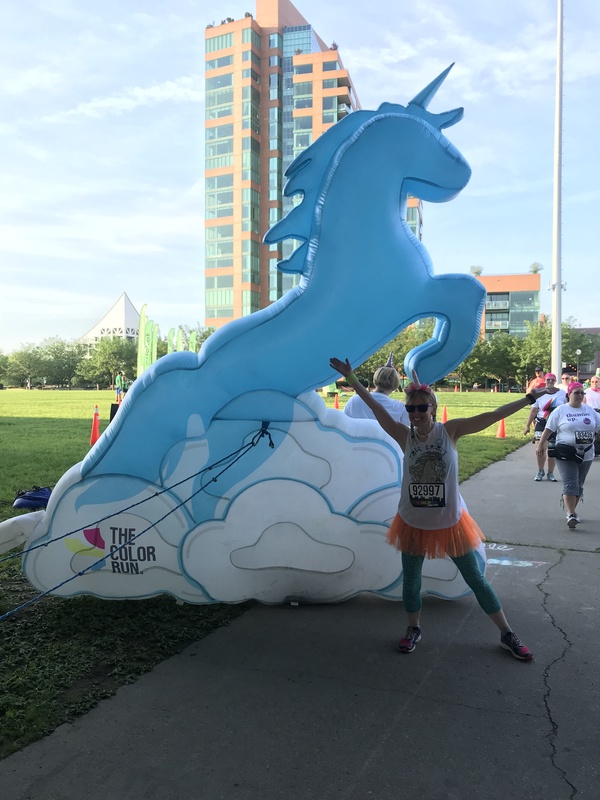 So, when my coach, Linda, offered me the opportunity to act as an official pacer for The Filly Women’s Half Marathon in Louisville, I jumped at the chance. 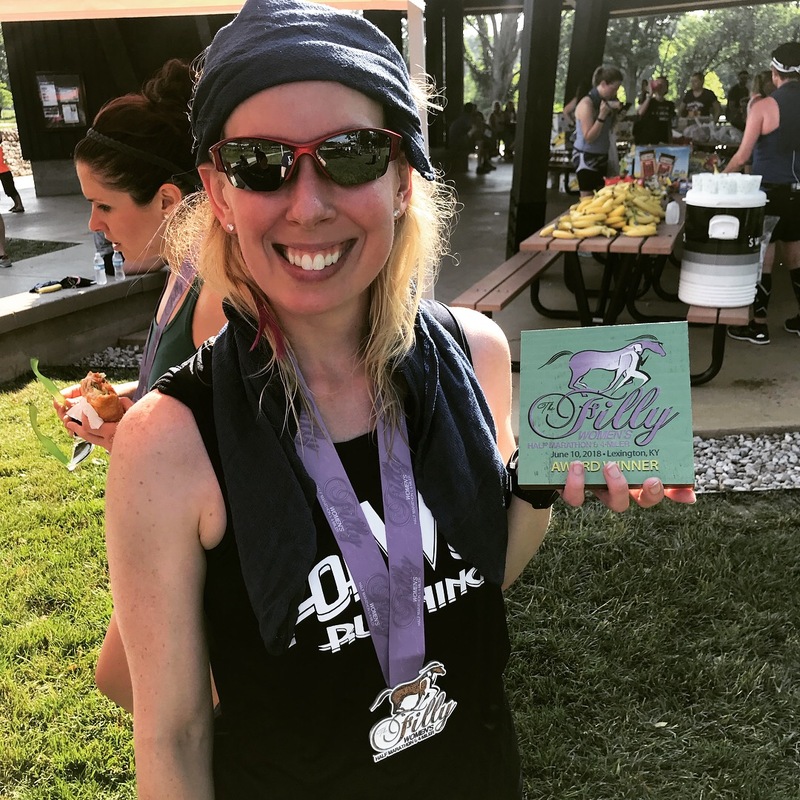 Because this is a great way for me to not only help other women/runners meet their goals…but also it’s a way to give back to the running community. Since I had already planned on running it…I told her I would be more than happy to do it. Because here is the thing with pacing…the race is not yours. It’s now your job to get your people to the finish line in a certain amount of time. And I was selected to be the 2 hour pacer…which was perfectly fine with me. That meant running around a 9 minute mile evenly to get in ahead of the 2 hour. First time as an official pacer! The problem is…it’s really difficult for me to dial back pace in practice…when I’m running alone. I set my watch to a certain range to buzz at me should I go over or under said pace range…but it was a challenge. And it was stressful. And I was so certain that I was just going to be terrible…but I kept on keeping on and working on it. I just wanted to be a good pacer. I wanted to get these women to their 2 hour half marathon. And I wanted to do it without being all over the place like the hot mess I am at times. HA! I did both of the training runs that were offered. The first one, I did the entire course, and with a few walk breaks, I cam in relatively close to time. Still too fast. 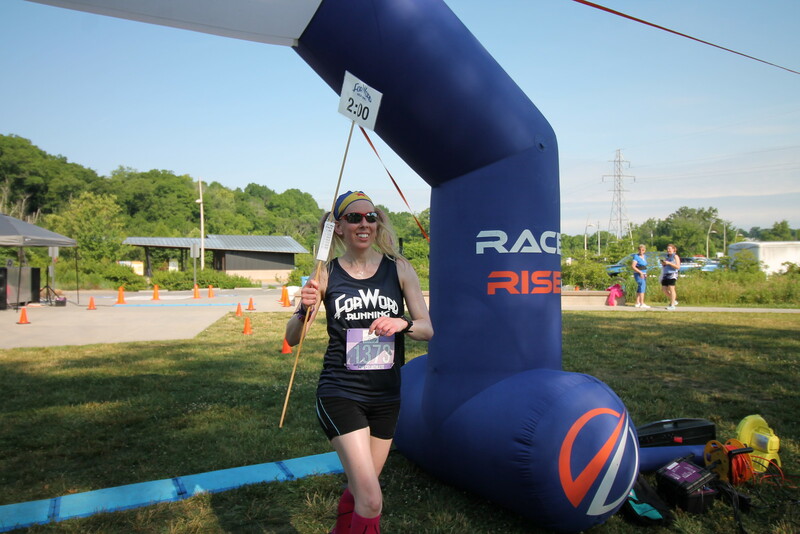 The second time, i only ran 8 miles…so it was hard to gauge, but I felt like I was a little closer to the range. It didn’t hurt that now the weather was starting to get swampy and pretty much unbearable once the sun was officially up. This would make for an interesting race day. As would the predicted weather, which had originally been calling for rain and storms at race time. 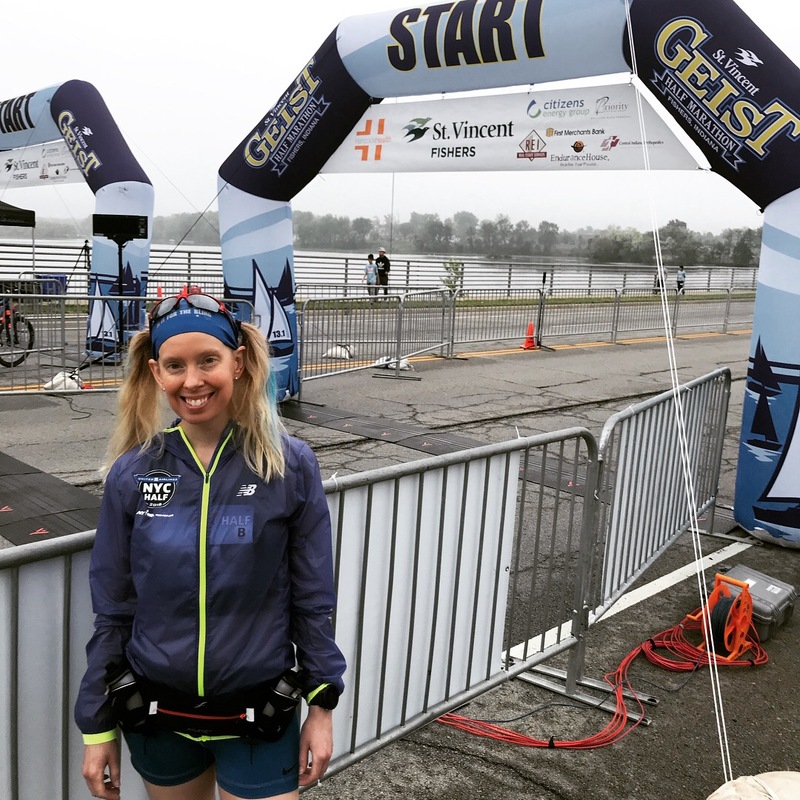 I literally wasn’t sure what would be waiting for me at the start line when I got up that morning, because the weather was juts all over the place all week…and thunderstorms had gone through the night before. That morning, I ate my cereal and got my Honey Stinger Gel tucked into the zipper pocket of my shorts. 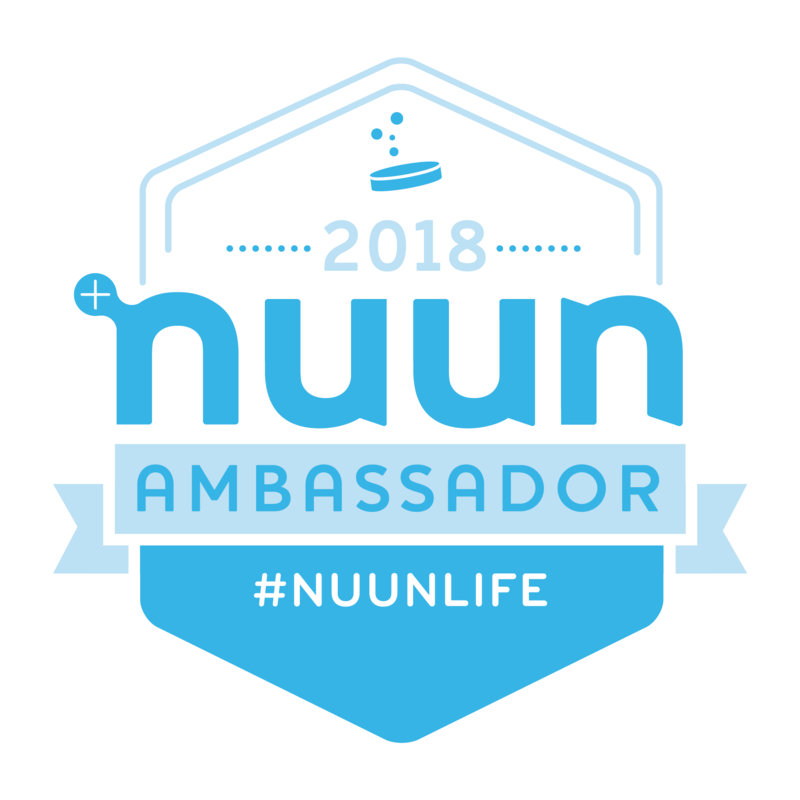 As it was humid out, I drank down 20 ounces of water, and prepped 16 more to take with me in the car with a NUUN tablet in it for extra electrolytes. 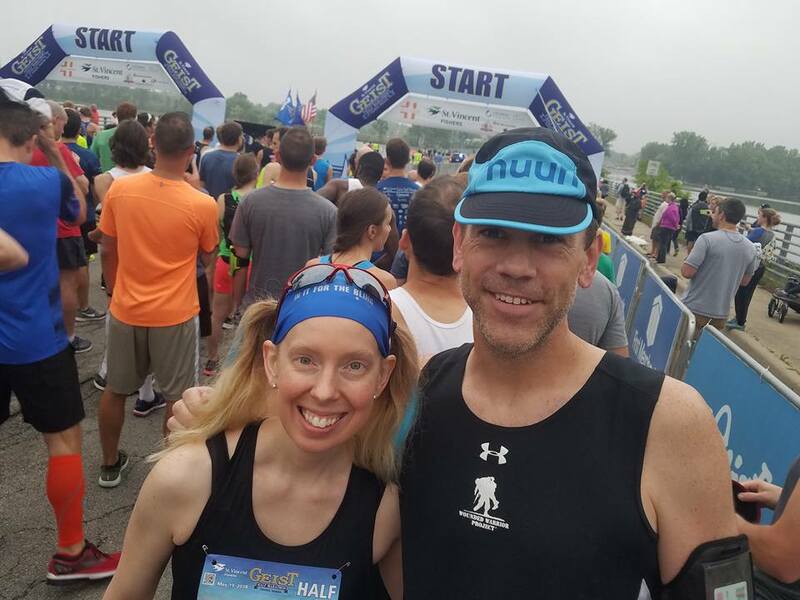 I tucked my Owyn Dark Chocolate Protein Shake into a cooler to keep it cool so I could have it about 30 minutes before the start of the race…and Cathy got up and got ready and we were out the door and being picked up by our friends Melissa and Paul to head to the Parklands. The race started at the Egg Lawn, and I was a bundle of nerves, let me tell you. This was my first time as an official pacer. I’ve paced friends before, trying to help them achieve their goals…and ultimately, that has never worked out. And I was terrified that I would end up alone out there…or that I would go to fast, go to slow…be late into the finish line. Things I never worried about before because I only had to run for me. If it was hot and I needed to slow down, I could. If it was perfect and I could speed up…I would. 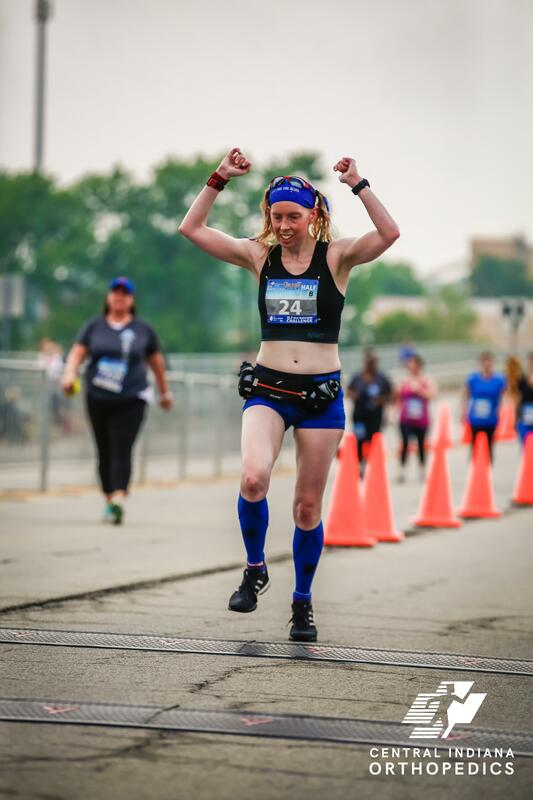 But this time…I was set to strictly run about a 9 min mile with even splits to get to the finish line at 1:59:00 or just slightly before that 2 hour mark. That’s a lot of stress. 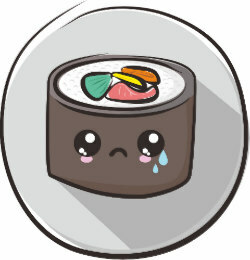 At least for me. Because…hello perfectionist. We arrived and the parking situation was already a mess. We were told that if we got there early, we’d be able to park at the start line. We actually did get their early, but they wouldn’t let us go that way. So, we ended up parking in a field and having to make the hike to the pavilion where everyone was meeting. 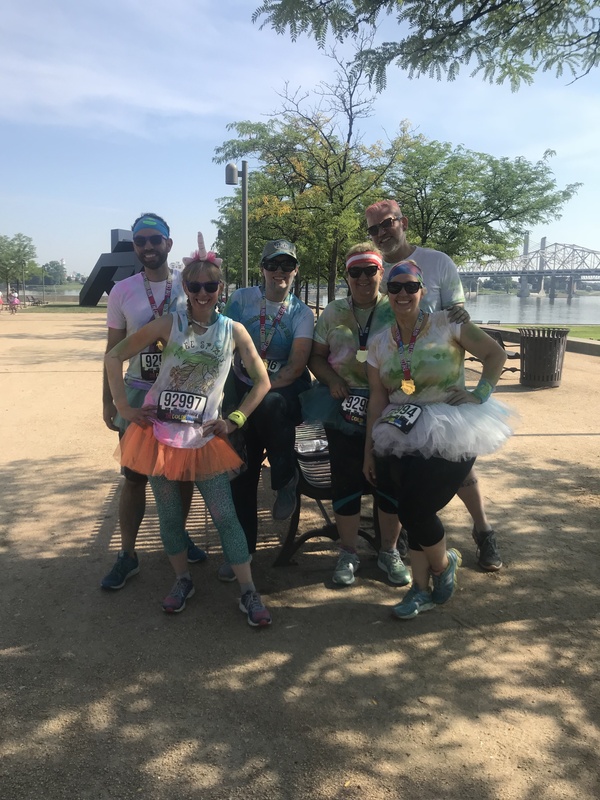 It was annoying in that we all had thought we’d have access to the vehicle for before and after the race…and being a pacer, that was sort of important. Needless to say, we made the walk and I met up with Linda and put on my ForWord Running Pacer tank. I was wearing the T-shirt, but when I was doing one of the training runs with Linda, asked about tank tops…she made it happen. And now I won’t die. She could tell I was nervous, so she said really nice reassuring things to me, helped me tape my paces onto my pace stick. Which, reminded me that I have always hated carrying things while running…so this was going to be fun. 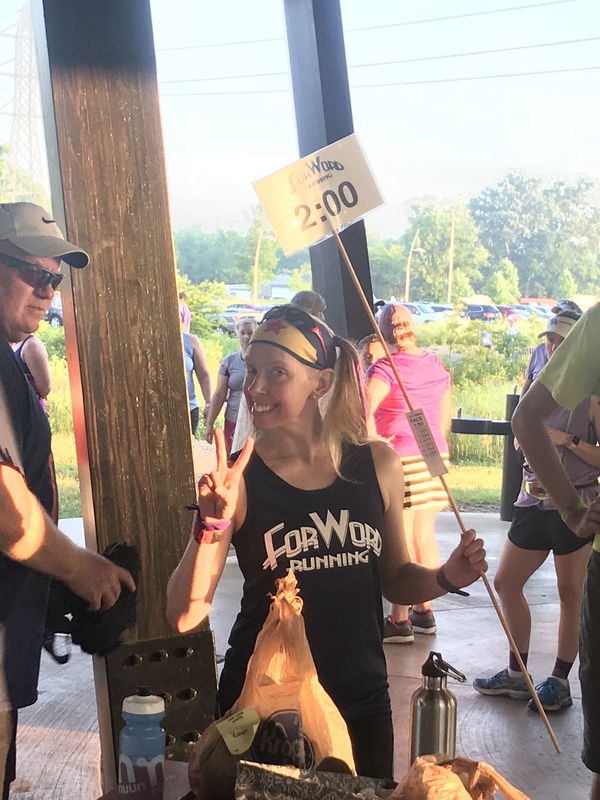 Last time I carried something during a race was the Indy Women’s Half Marathon in 2012…and it was a water bottle that I really, really just wanted to toss and never see again. HA! 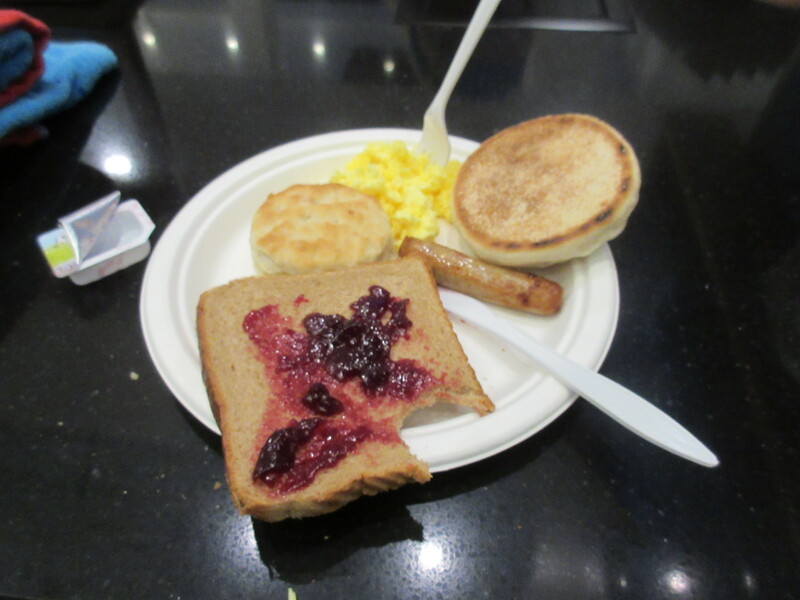 We took some pictures of the pacers and I made sure I was fueled, hydrated, and ready to run. I went to use the bathroom because…we had to get here early and I was NOT going to be dehydrated when I could potentially have others counting on me to see them in. There was a lot of confusion about the start of the Filly Women’s Half Marathon. The start gate wasn’t on the road proper, but sort of off to the side. And at the time, a truck was still parked in front of it. 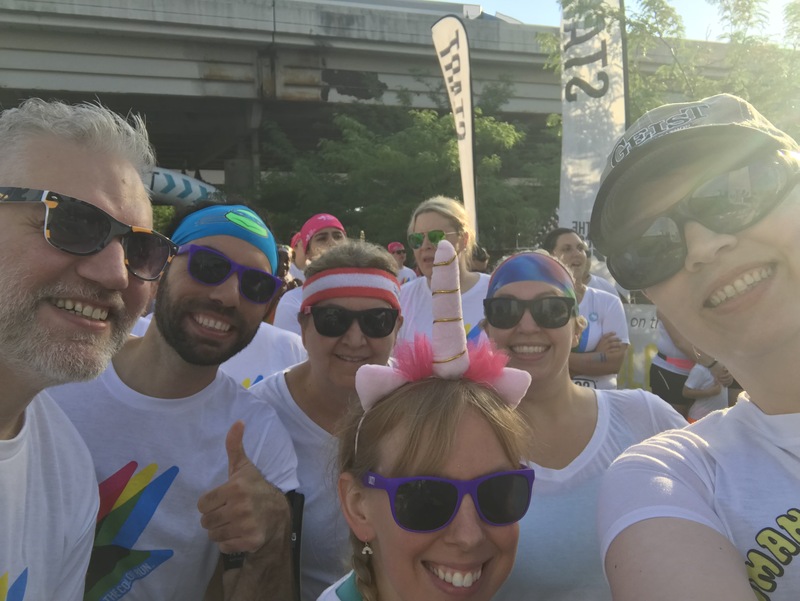 We were getting dangerously close to start time and none of us could see a start mat…and anyone holding a pacer sign was getting asked about it. No one seemed to have answers…until the emcee had us all move over to the side road with the start gate. Still no sign of anything that would catch the official start of the race. There was a couple of race announcements and talks…but soon we were all asked to move forward for the race to get underway. Linda was pacing the lead on her bike…so at her ready…the announcement was given…and we were off. I crossed through the start gate and hoped for the best. 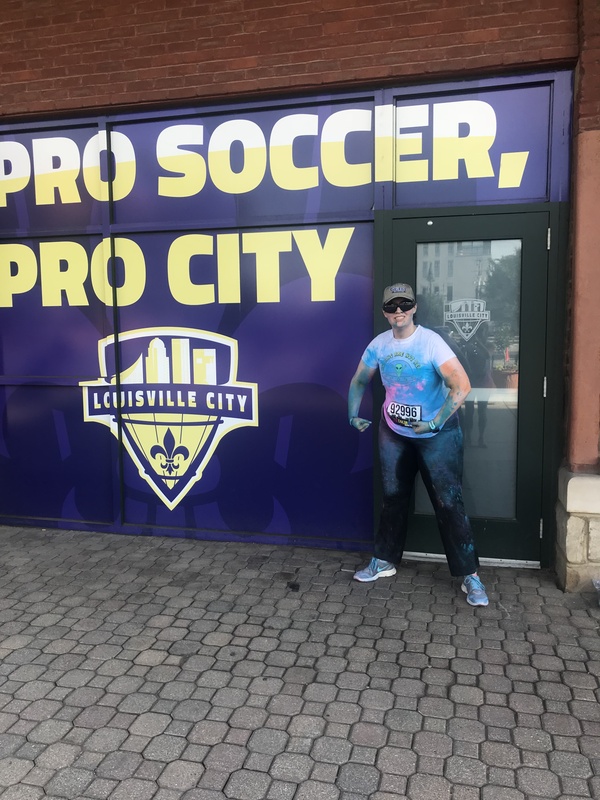 As I settled into position on the road around the Egg Lawn, I did notice that I had a small group of ladies running with me. So…conversation time! “Are you guys my 2-hour group?” They all said yes. So, I introduced myself and we were cruising through that first mile. One of the ladies started up some tunes, all of which I was enjoying. And at Mile 1 I checked my watch and we were definitely going too fast. I announced that now that we found our space, we were backing off and settling in. Some women continued on ahead at the original pace, but some fell back with me. As we entered the second mile, I also knew that Damien…the hill of DOOOOOOM was coming up. It is a pretty steep monster there in the Parklands (the MRTT/SRTT group named it Damien because it makes devil horns on your elevation chart when it’s included in the beginning and end of your runs there. As we neared it, I was chatting with some of the ladies still with me. One had just gotten back from Sydney, Australia. She had raced there and said the temperatures were much better there (Australia is in their winter and we were heading into summer). 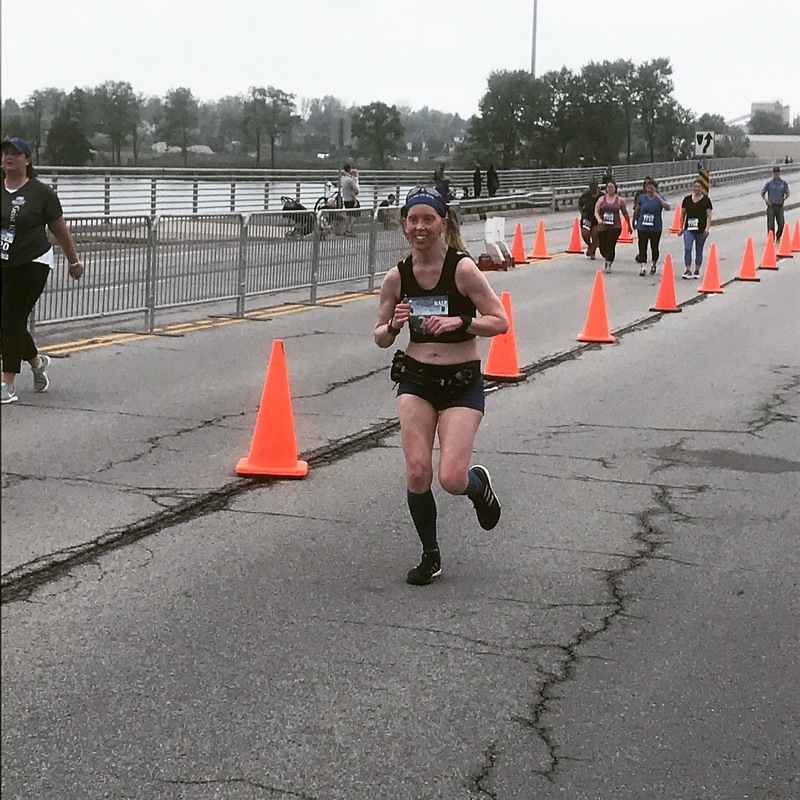 At the hill, as I was trying to keep on pace, I climbed it with power (realistically, this is the only way I know how to do hills as I’ve always climbed them for races and hill repeats…all of which make you drive up them hard). 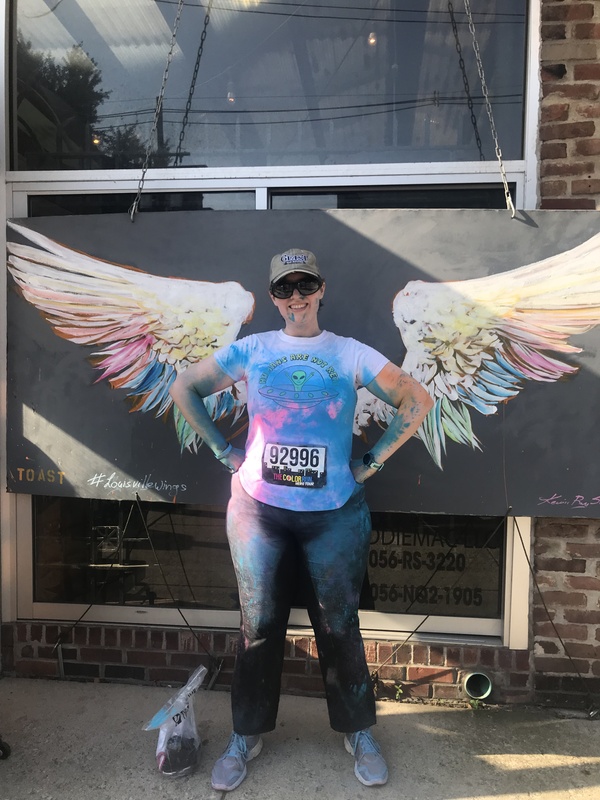 Some women started walking up it (when I race here, this is what I do because it’s too early to expend that kind of energy) but I couldn’t this time. Some ladies got to the top and took a walk break. Some continued on with me. 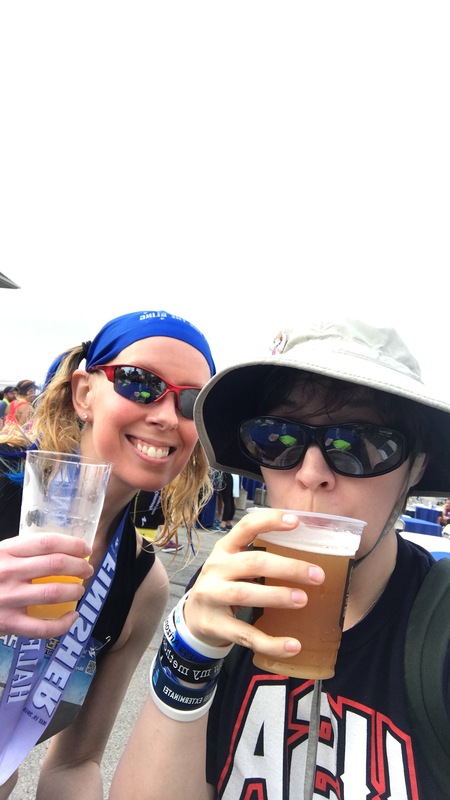 Hydrating while pacing through the MRTT/SRTT hydration station! I know this course like the back of my hand. The sun was fierce that day, and it was hot and humid. It normally is in this area. But as we got onto the narrow path and out of the road, I was keeping some spirits high. “We’re almost into a shaded downhill, ladies!” I glanced at my watch to check my pace and someone asked if we were behind. I told her that we weren’t…we were actually just slightly ahead and this downhill would be good because after we turned around, we’d have to come back UP this hill (and in the two training runs, this hill slowed me down EVERY. SINGLE. TIME. on the way back). We cruised down the hill, and crossed over to enter Pope Lick Park Park. 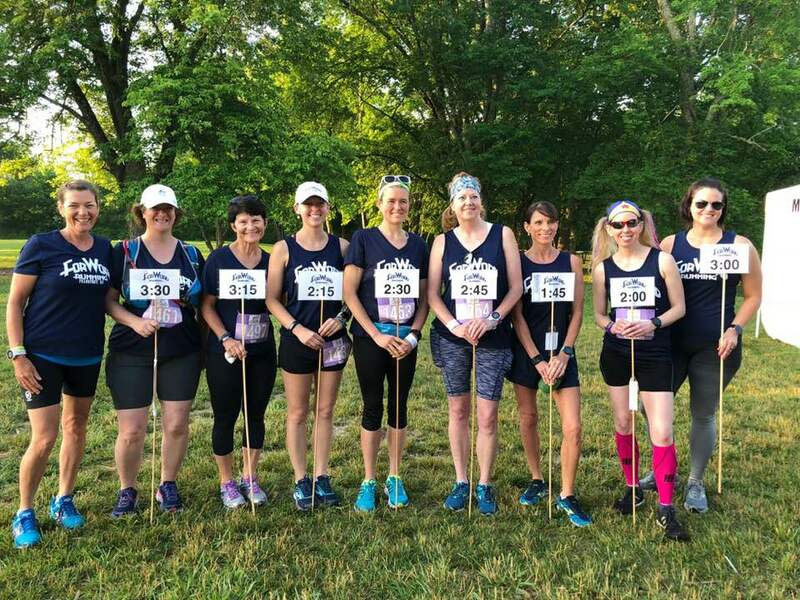 I knew that at the soccer fields, the amazing ladies of the local MRTT/SRTT group would be there cheering and bringing refreshments. As I was not carrying fuel with me…I was going to try to make it on the Sword (I have never fueled on Sword) and water at the water stops. This meant a few walk breaks at each one as necessary. I paced myself accordingly. At this point, I had one runner with me. She was super nice and we talked about other races we had done. She said she was starting to feel the humidity fatigue her and after we went through the cheer zone, where ladies were kind enough to ask if they needed to slow me down (I have a reputation)…she said she was falling back and would try to catch up. I told her she would…and I’d see her soon. And now…my dear friends…let me tell you a tale of a 2 hour pacer…who was left alone. There were runners ahead…and I could hear some runners behind…but there was no one with me from about Mile 5 through…Mile 12. I wish I could say I was joking. I’m not. But I made sure I kept my pace going and took walk breaks regardless. 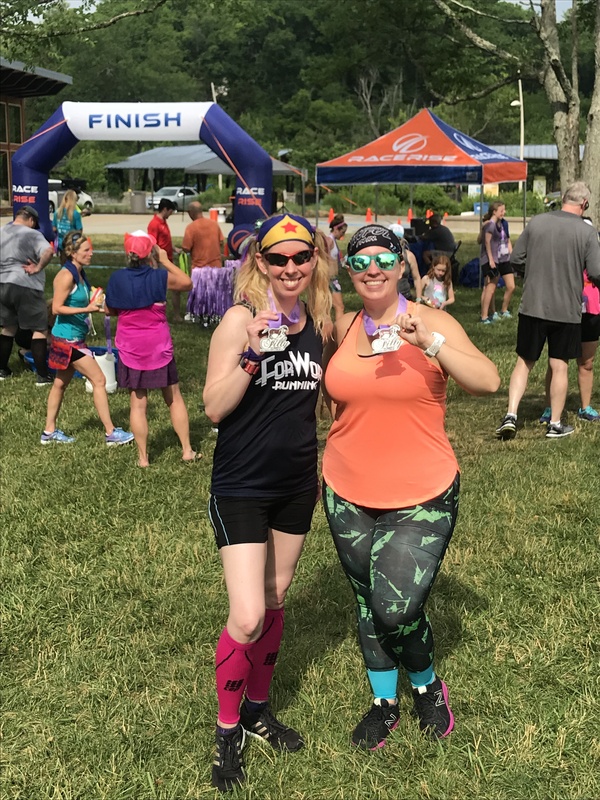 Just in case some women fell back and needed me to see them in to their Goal B instead of Goal A. I passed Linda, who was guiding the lead runner (who didn’t even look winded) back to the Egg Lawn to finish. I cheered for the ladies who were already on their way back, telling them they were doing awesome. Originally we were told we’d be turning around before the bridge, but that had changed. We now were heading over the bridge to the final water stop before turning around. I just assumed that this was actually where we turned around (there was a sign there that had the loop…so that’s what I did. And…I headed back. At first my watch beeped ahead of time for Mile 7…but it all settled back into the correct numbers as I got past that. I think it was just because there was a convenient spot on the bridge to put that mile marker. After the turn around, I was still alone, so I set my task on cheering for and encouraging all the women making their way toward the turn around point. It was a miserable day and I could tell a log of women were not hitting paces or expectations that they had set for themselves. Funny how just a little bit of encouragement can turn that around. 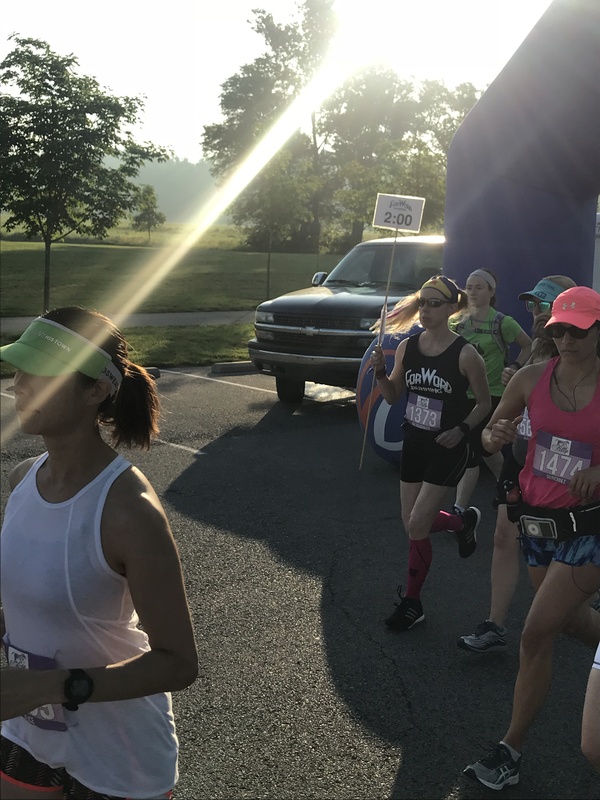 I gave a lot of “Looking Strong!”, “You’re doing great!”, “GO LADIES!” as I ran my way back through the course, enjoying the moments of shade, and dreading those open sunny paths at times. As I passed more of the pacers they all kindly asked me if they needed to stop me or slow me down. I told you I have a reputation. I would check and tell them I was doing good! And I was! At the stand-alone water stop that was out there (Hydration Station 4A)…I popped my Honey Stinger gel (I didn’t feel like I needed it, but I wanted to be sure I had the energy to finish this, even if I remained alone). I downed some water and carried on, picking it back up to get back on pace. All the while…shouting more words of encouragement along the way. Soon the steady stream of ladies going the other way dwindled and I was back to just pacing it in. I hit the MRTT/SRTT station again, and took a Sword and a walk…and made sure they knew that I didn’t need to be slowed down. Seriously, every time I heard that phrase it made me laugh and smile. And not pay attention to the heat and humidity. I remained alone as I came out of Pope Lick and headed back toward Beckley Creek Park, where the finish line was waiting. The hill I was dreading, I now was facing on my own. So…I started the climb…and I could tell I was behind on the pace going up. But I knew I had a small bit of cushioning to allow for that. Even with the water stops I walked through to fuel and hydrate. I did my best to push it enough so that when I hit Mile 11 just after hitting the top of the winding, shaded path, I could make sure I was still right on pace. And it worked. Despite being alone, I kept the proper pace and worked hard to maintain it. You just never know when someone might turn up and rely on you to get them to the finish. Even those ahead of you. And they crossed and then…I followed right behind them. 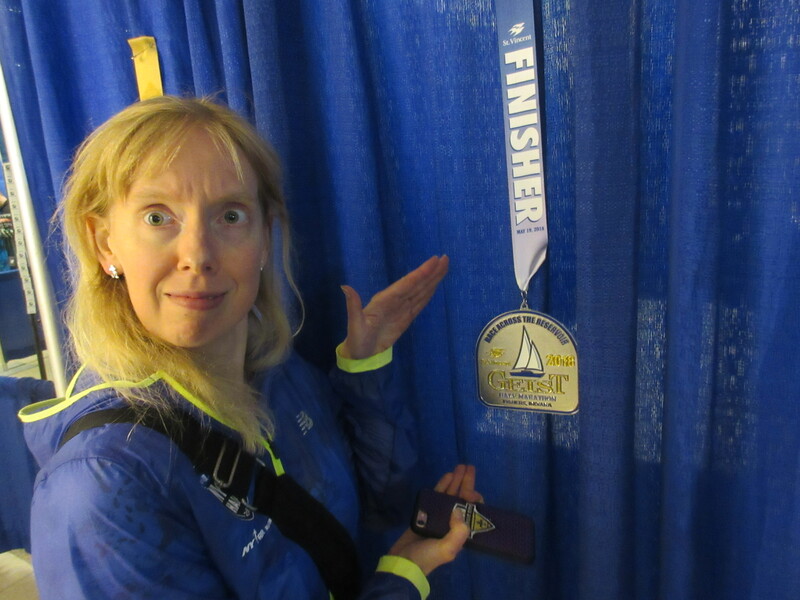 Clocking in at 1:59:09…which, my coach, Linda, would say…was perfect. 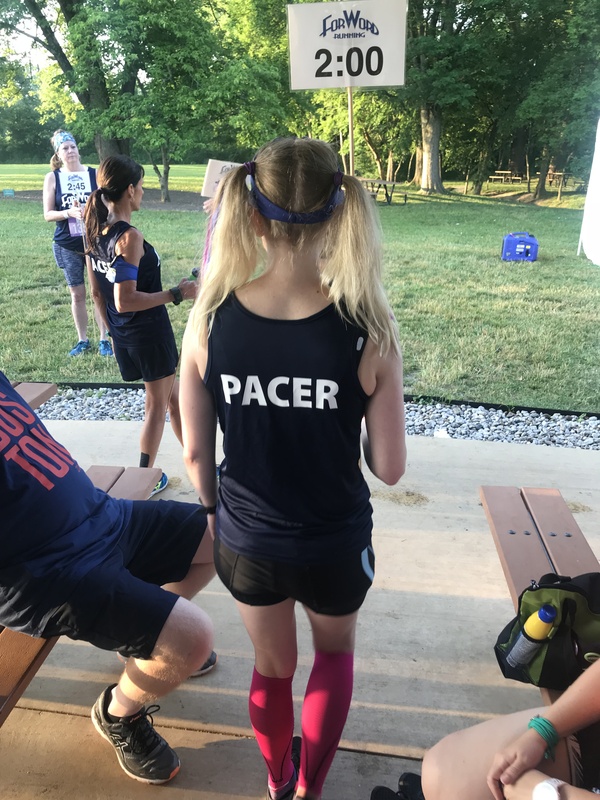 They announced my name as the pacer and I went to step out of the way of anyone who might be right behind me. No one was immediately there. My friend, Pam, who I met in the MRTT/SRTT coffee run came over to give me a medal and a cold towel, which was put around my neck. 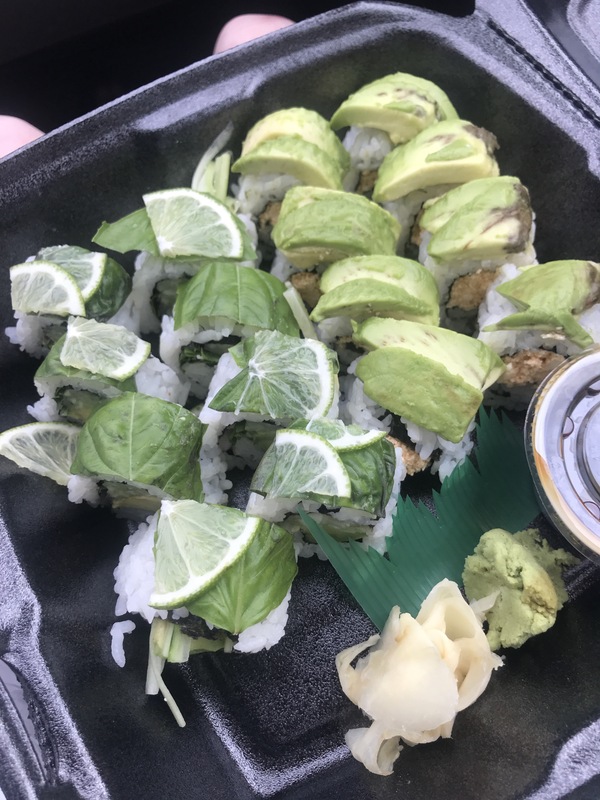 That was heaven. 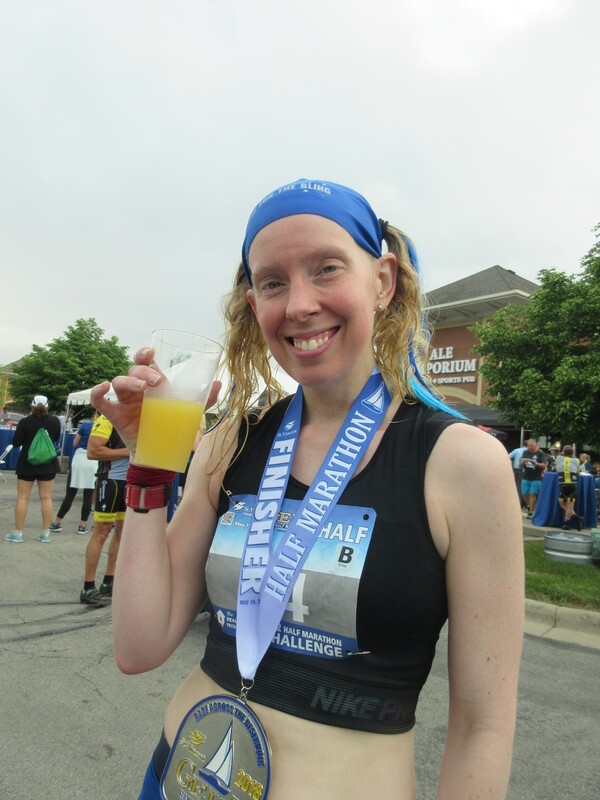 The after party had treats and snacks galore…but I went over to see how Melissa did on the 4-Miler and relax. My job here was done. While I was unwinding, Cathy looked up results and said I had won an age group award. 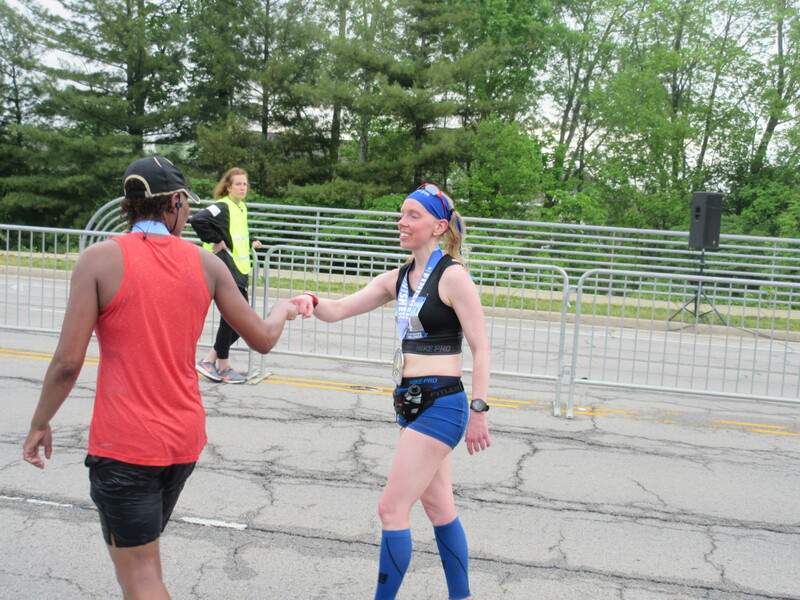 I wasn’t sure what the process was when you’re a pacer, but when the person who came in after me was 7 minutes behind…I was given the okay to claim it. 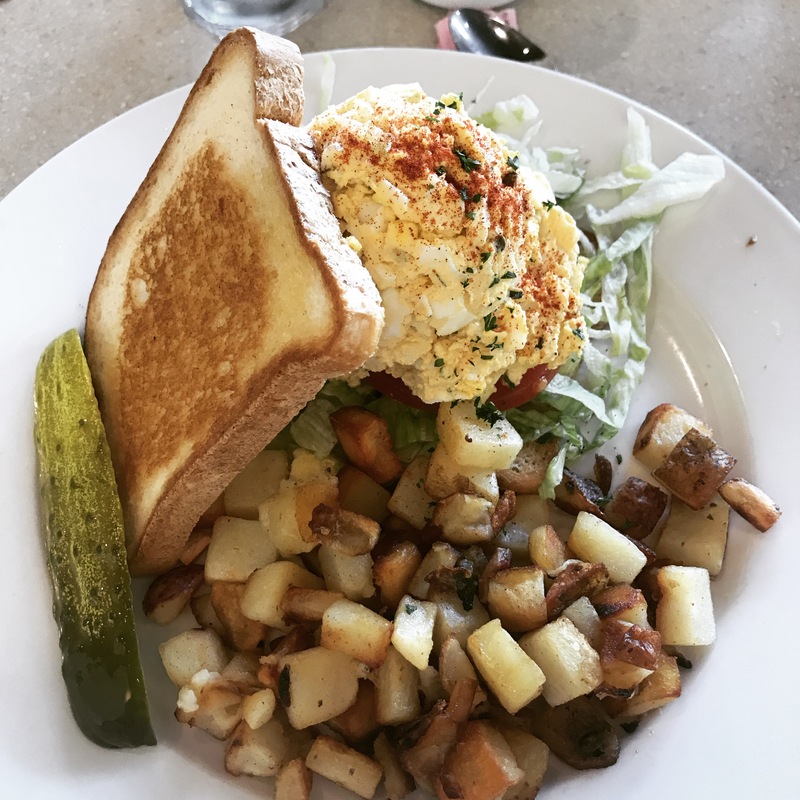 Brunch was a Gluten Free Pop’s Poppin’ Egg Salad Sandwich at Wild Eggs! There is something so amazing and empowering about all women races. I love doing them…and this time…I loved being a part of the team that was there to help others reach their goals. And I fell in love with the job of being a pacer. I might have been alone with it, but it challenged me to slow down, to take it in, to help others, and to get out of my comfort zone. I got my medal engraved with my name, finishing time, and the word “PACER” underneath it. And then, Melissa, Paul, Cathy and I went out to Wild Eggs for a celebratory brunch, before hitting Costco and heading home. 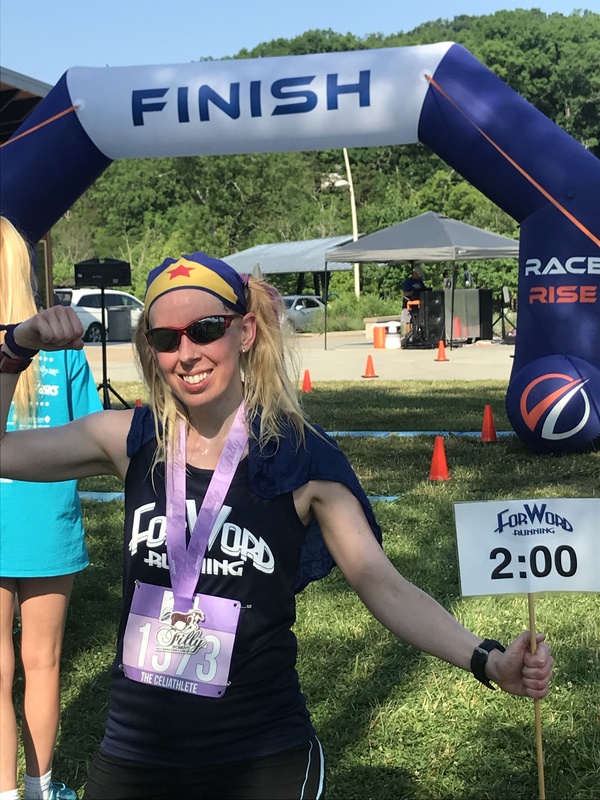 So, the official results of The Filly Women’s Half Marathon are that I finished in 1:59:09, perfect timing for the 2 hour pacer, yes? *FIST PUMP* I was 14/184 finishers overall. And I was 2/29 women in my age division. If this race returns next year, I’ll definitely be signing up again. 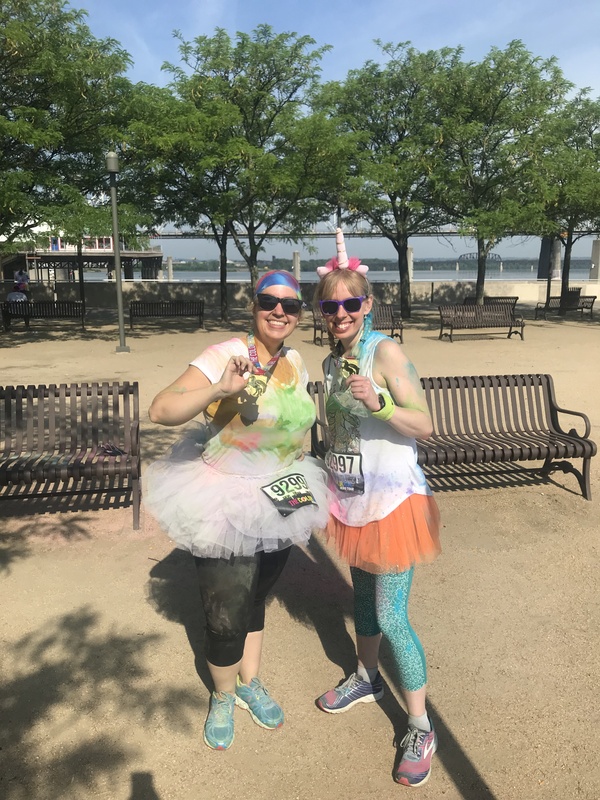 It was a total blast and I loved seeing all the ladies come out to run their best and be their best. And that, my friends, is what an all female race is about. OH…and that pacing stick…I forgot I was carrying it. Never once felt annoyed by it.